Even when a dog doesn’t hold an official role in the workplace, companies worldwide are still finding reasons to introduce pets into their workplace. In 2010, a study by Central Michigan University found that people working in groups are more cooperative when a dog is a member of the team. A Research Fellow at the University of Western Australia, Dr Lisa Wood, has also published information to help Australian local government organisations review how pets can strengthen communities. She claims pet friendly work environments reduce stress, increase productivity, boost morale and strengthen employee relationships. This initiative is becoming universally widespread, with businesses in Taiwan and the USA in particular embracing pets. Multinational Corporation Google is among them, their Code of Conduct stating “We’re a dog company”. However, owners should always assess whether their pet is suited to their work environment, before introducing them to the workplace. For example, territorial or untrained dogs could potentially disrupt other employees. 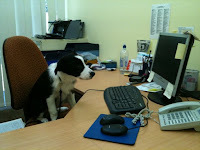 Clearly, pet friendly workplaces can provide the ultimate work / life balance we all strive to achieve. Dogs really are a productive member of the workforce, so why not investigate making your work pet friendly? I would recommend it.